Lemax Singing Carols Figurines depicts a dickensian couple singing Christmas carols by street lamp, whilst a dog watches on. Singing Carols brings home the delightful era where Victorian street carolers brought Christmas cheer to the community. A Lemax Winter street addition suited for placement in a Lemax seasonal Christmas miniatures display. A recent multi figurine addition for the Lemax Caddington Village catalogue, joining the collection in 2014. 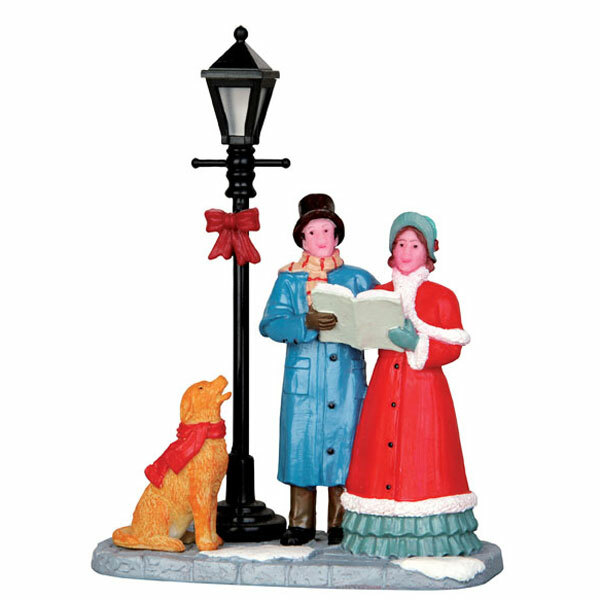 Singing Carols is a hand painted polyresin multi figurine piece mounted on a snowed single base to compliment your seasonal Lemax Village display.